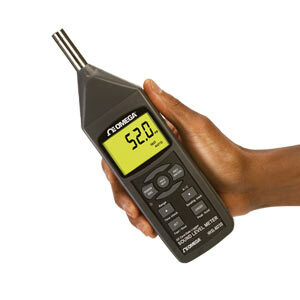 The HHSL402SD is a generalpurpose handheld instrument that measures the noise level of an environment or the sound level produced by a piece of machinery. Using an integrated 13 mm (0.5") condenser microphone, the meter can measure sound levels from 30 to 130 dB with a resolution of 0.1 dB and show the results on a front-panel liquid-crystal display. Several features and capabilities enhance the meter’s versatility. Among them are autoranging, the ability to hold readings and display maximum and minimum readings, and user-settable measurement parameters such as frequency weighting (using the “A” and “C” standards) and time weighting (fast or slow). Because it is microprocessor-based, the HHSL402SD can make full use of the portability, reliability and large storage capacities that SD memory cards offer. Measurements can be made automatically at any sampling rate between one second and one hour. After timestamping and storing the measurements on an SD card plugged into the instrument, the user can remove the card and plug it into to a laptop or desktop computer either directly or via a USB card reader. The data points are stored on the card as files with the .xls extension, which can be opened by Microsoft’s Excel application. The HHSL402SD has a backlit 64 mm (2.5") diagonal display and is powered by six “AA” alkaline batteries or an optional 9V AC/DC adaptor. Nota: Comes complete with sound wind shield ball, 6 “AA” batteries, hard carrying case, 2 GB SD memory card, and operator’s manual.